!! The Sniper´s History @ The Snipers Homepage : All the Naked Facts !! The Sniper has special abilities, training, and equipment. His job is to deliver discriminatory, highly accurate rifle fire against enemy targets, which cannot be engaged successfully by the rifleman because of range, size, location, fleeting nature, or visibility. Sniping requires the development of basic infantry skills to a high degree of perfection. A Sniper's training incorporates a wide variety of subjects designed to increase his value as a force multiplier and to ensure his survival on the Battlefield. The art of Sniping requires learning and repetitiously practicing these skills until mastered. 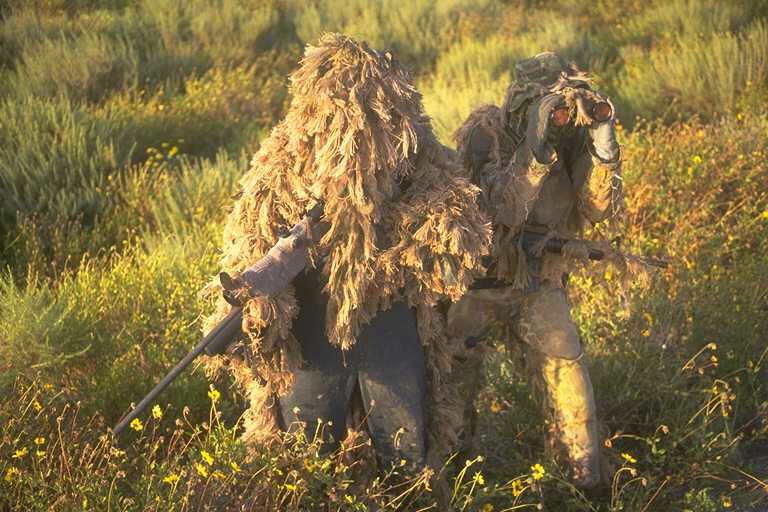 A Sniper must be highly trained in long range rifle marksmanship and field craft skills to ensure maximum effective engagements with minimum risk. COL. Hiram Berdan - Placed Sharpshooters in key places on the Battlefields of the Civil War to shoot key leaders and other important persons. MAJ. Hesketh Pritchard - Started the first British Sniper course called " The First Army School of Sniping, Observing, and Scouting." MAJ. KOENIG Germany -A German hero was sent to Stalingrad to "finish" the Soviet sniper Zaitsev that was demoralizing the German troops The Germans were the first to coin the phrase "Sniper" for military use. 1930 -SGT. VASILI ZAITSEV , finished Maj. Koenig´s career at Stalingrad Russia carefully integrated two man Sniper team tactics. USMC Scout/Sniper Schools 1942With two schools one at Camp Lejeune NC and the other at Green´s Farm CA, USMC tried to have an impact on the development of WWII but where too late. 1955-1956 - The USA Marksmanship Training Unit conducted a centralized Sniper school using the 1903 Springfield A5. 1966 The 1st DIV sniper school opens near DaNang RVN. Fall66 Scout/Sniper School at Camp Pendletton The sniper rifles where in short supply until spring 67 when the first M40 were delivered. Jan. 1969-July 1969 - 1,250 reported KIA by US Snipers. The average Infantry soldier used 200,000 rounds per KIA compared to 1.3 for the Sniper. 1987 - United States Army Sniper School was started on Ft. Benning, Ga. and still operates today. Jan 91 the NEW ERA Thefirst BARRETT .50 Sniper Rifles w/Unertl Scope fielded in time for Dessert Storm. "Please ask the Secretary of the Navy to investigate to determine if the actions of Carlos N. Hathcock II, on September 16, 1969, while engaged in combat with enemy forces in the Republic of Vietnam, meet the criteria for award of the Congressional Medal of Honor. I believe his actions on that day merit this award; and I am confident that you will feel the same way when you learn the full story of his heroism and sacrifice." Should your Congressman or Senators not be familiar with the circumstances of September 16, 1969; fax or mail them the below extract from the book "Marine Sniper" by Charles Henderson. If we all act NOW, the courage of Carlos Hathcock WILL be recognized at long last. It is now or never. Carlos is in ill health, and can't wait forever. Please don't let his bravery go unrecognized any longer. I have spoken to two of the men who were on the amtrac that fateful day. They both believe Carlos deserves the Medal of Honor, and that he saved their lives. BTW: A request for award of the Congressional Medal of Honor to Carlos is at this moment making it's way up the Marine Corps chain of command. Public and Congressional support will ensure it is given fair consideration. Thanks to all who support Carlos in his hour of need; as he once supported us all. Ernie P.